Oh well... there are 24 other fairs to apply to... sigh. Lisa McCarthy is Jessica Dawson's excellent choice in the Real Art D.C. thingie the WaPo is doing. Deanna Schwartzberg reviews the current show by Judith Peck at the International Art and Artists Hillyer Art Space in DC. Judith Peck is both an artist and an intellectual. Her paintings are often generated by her abiding concern for social justice. Although she infuses her work with ideological content, it is in the exquisite execution of her subject, that we see not only the process of her mind, but her soul as well. In her current exhibit, "Original Position", at the International Art and Artists Hillyer Art Space, June 4-26, 2010, it is a thought experiment by John Rawls that inspired the artist. Rawls states that if we step behind a veil to cloak our knowledge of our individual abilities, social status and income, it might render us able to effectively consider the interests of all people, especially the least advantaged members of society. Ms. Peck incorporates the concept of the veil in all of the portraits on display, each taking on a different aspect of the human condition, i.e. gender, passion, and conscience. Without prior knowledge of the artist's text, these paintings speak to us on a visceral level. 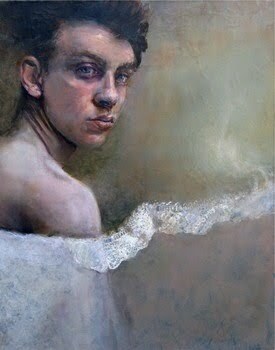 Her portraits are drawn from live models and composites of the human face and appear to be lit from within. They are infused with a mysterious drama that captures the viewer's attention. On closer examination, we become transfixed in the subject's gaze. These subjects are never emotionally distant, their eyes penetrate and connect with the viewer's own, engaging our thoughts and connecting with our emotions. On a recent trip to Boston, I viewed Rembrandt's "Self Portrait" in the Gardner Museum. I was enthralled with the delicacy of the painted surface, the fullness of his mouth, the rich textures of his hair and clothing, but most importantly, his eyes. Through his eyes I felt a knowing kinship with the sitter. What if Rembrandt were alive today? He would not only give us a window into the world around him, but into his own mind as well. As a modern artist, he might use his art to relate in visual terms the essence of his core beliefs and allow us as viewers to engage in a dialogue with him. Judith Peck is a classically trained artist of infinite skill. Her work captivated me with a similar intimacy I found in the Rembrandt portrait, with the added benefit of symbolic imagery and metaphor that in the modern world serve to make the art both personal and timely. About the author: Deanna Schwartzberg is an artist and painting instructor in the Washington area. She has taught painting at various venues including the Corcoran College of Art and Design, Vis Arts, and at the Art League School in the Torpedo Factory for over twenty years. She received a B.S. in Art Education from N.Y.U. and studied painting at the Art Student's League of New York with a student of Hans Hoffman. Deanna's work in painted paper assemblage and paintings on canvas deal with abstracting the human form.